Host Intro: An old German proverb says “The Garden is the Poor Man’s Apothecary.” Nowadays gardens, and specifically community gardens could be described as “the Poor Man’s Pantry” by being sites for food production as well as places for social and cultural exchange. 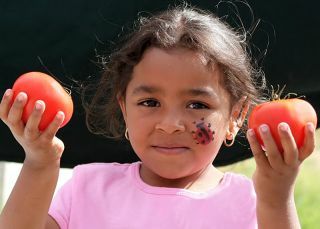 This week in our nutrition series we’ve heard about one schools efforts teach its students about good nutrition through its garden and in turn reach out to the wider community. In this the last installment of “Eat Your Greens” KGNU’s Maeve Conran discovers how the garden brings much more than fresh vegetables to a community. Narration: Fairview science teacher Don Diehl welcomes people to the Tri Community Festival in the Fairview garden. Today it’s all about celebration. Don Diehl: “to celebrate the end of the growing season and just have community come together and to have a chance to enjoy the garden altogether. MC speaking over music: All you youngsters, all you kids, how many of you want to break a piñata? Narration: Although the children have been learning about the benefits of growing and eating healthy vegetables as part of the nutrition program, candy is allowed?..but just this once. Sound of kids hitting and getting candy from piñata. Narration: Denver Urban Gardens run the gardening classes at the school which compliment the Integrated Nutrition Education classes also taught at Fairview. It’s all about getting the kids to eat healthy, and they believe that if you can convince the kids to eat a salad, then you can convince the whole family? ?And of course when they’re doing the salads then they can come home and tell their parents “You know we just used this strange stuff this red cabbage it’s really good Mom, and we cut up fresh squash in the salad.? Customer: I?m going to take a couple of these tomatoes?.. Lisa: The tomatoes are 50cents a piece?..so you have 4 tomatoes there? Fades under narration: This Sun Valley resident didn’t even know the garden was here until today. Narration: As she gathers her purchases and her change, she vows to come back next Summer when the farmers market reopens. Narration: Back in the pumpkin patch I catch up with Justus who has moved on from Fairview but is still actively involved in the garden, and is optimistic about the future. Justus: We’re going to still work in the garden, it’s not that sad, it’s exciting? Narration: Justus is not the only ex Fairview student still involved Adolfo and Michael graduated a long time ago but still feel connected to the community through the garden. Michael explains. Michael: We still have family and friends here, so we still come back to support them and we still come back to help in the garden, so we can give back to the community that we grew up in. Narration: Michael is now in college and has moved away from Sun Valley. He plans to return next summer again to help out and teach others what he has learned about gardening?quite an achievement for this former Fairview student. As the festival winds down, Mr. Diehl and the children start to prepare the garden for the winter and talk about plans for moving the gardening classes indoors? Don Diehl: We’ll start nutrition classes, instead of actually coming out and gardening on Wednesdays, we’ll do more of a nutrition focus, we’ll make recipes in the room and then we’ll start growing seedlings for the winter time inside?.. Narration: Plans are already afoot for next summer’s farmers market. There are talks of expansion and they hope to convince the local corner store to offer more fresh produce, making healthier food even more accessible to the Sun Valley residents. Things are looking up for this previously forgotten neighborhood where the seeds of community have already taken root.